Navy Garden Flag - Nylon - 12x18"
High quality outdoor nylon Navy garden flag. 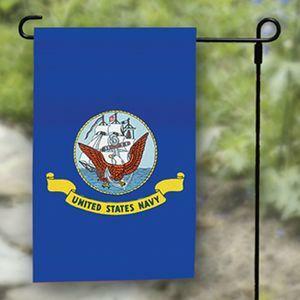 The Navy Garden Flag has a sleeved top that will slide on the popular garden style flagpoles. Our Navy yard flags are fully dyed for great outdoor performance. All our Navy Flags are proudly made in the USA. --- This dark blue Navy yard flag features a yellow banner with the words "United States Navy" written below the seal of the Department of the Navy. The seal of the Navy was created in 1951 and placed on the flag two years later. It portrays an eagle with wings outspread, seemingly defending a ship at sea. Similar to the other branches of the military, the Navy also utilizes battle streamers to signify their major battles. There are 28 streamers that date from the Revolutionary War through Desert Storm. The Navy flag is third in order of precedence on occasions of public flag displays.